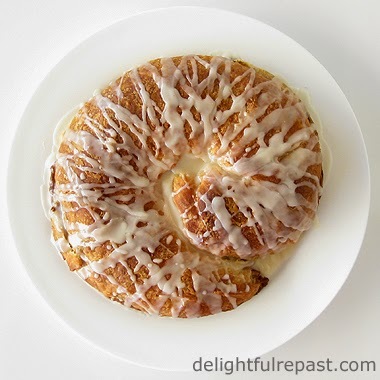 When I hear Coffee Cake, I instantly picture a yeast dough coffee cake. And since I was recently experimenting with Danish pastry (laminated yeast dough), of course I decided to use that for my coffee cake. And it was grrrrreat! Just as I usually opt for my Ruff Puff over regular puff pastry that takes so much longer, I will probably make my Easy Danish Dough far more often than the time-consuming regular version. It's so easy to just stir it up a day or two before you need it, then do the "turns" (rolling and folding) the next day. 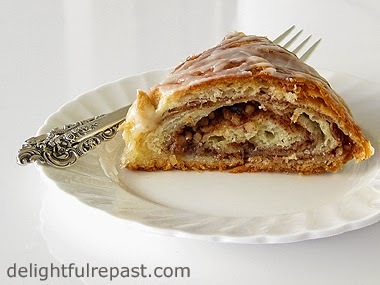 Sure, even the Easy Danish Dough is a bit more work than just the regular yeast dough you could use for this, but it is so worth it if you are a fan of flakiness and appreciate that little something extra. If you just want to make one coffee cake, go ahead and make the full dough recipe and refrigerate or freeze half for another day; and make a half recipe of the filling and glaze. 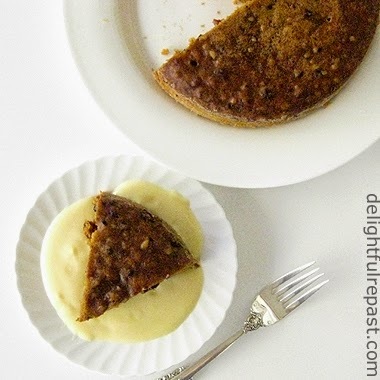 I know it's called coffee cake, but it is fabulous with a nice cup of tea! 1 In large bowl whisk together flour, sugar, yeast and salt. Stir in the cold chunks of butter, squishing them a bit with your fingers to distribute through the flour. 2 In small bowl whisk together milk, water and egg. Stir the liquid mixture into the flour to form a very sticky wet dough, chunky with butter. Cover and refrigerate for at least 8 hours or up to 2 days. 3 Measure out the 1/2 cup flour to use on surface and for rolling out dough. Turn dough out onto lightly floured surface. 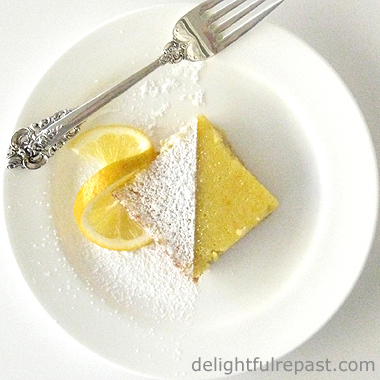 Sprinkle lightly with flour and pat into a square shape. 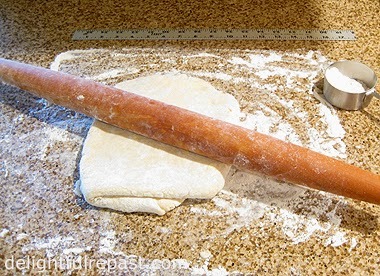 With rolling pin, roll it into a 16-inch square. Fold it in thirds, like a business letter, and roll into about a 10x16-inch rectangle. Fold in thirds. Note: You'll need a bench scraper for the first few turns, as it's pretty messy at that point--not like the smooth dough it eventually turns into (see below)! 4 Repeat twice. Wrap in plastic and refrigerate for about 45 minutes. 5 Roll the chilled dough into a 16-inch square and fold into thirds, like a business letter, then in thirds again to make a square. 6 Repeat twice. Wrap in plastic and refrigerate for about 45 minutes or up to 2 days. 7 Make filling. Stir together nuts, flour, sugar, cinnamon and salt. 8 When ready to make coffeecake(s), cut the dough into 2 pieces. While working with the first one, chill the second one. If making just one cake, double wrap the second half of dough and refrigerate for up to 2 days or freeze for up to a month. 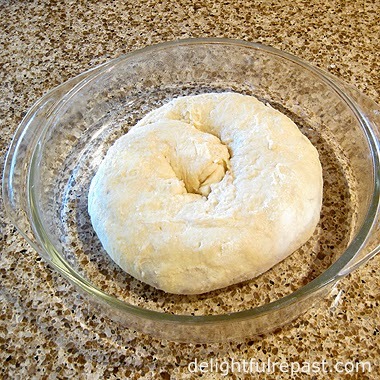 9 Roll one piece of dough into a 13- to 14-inch square. Spread on half the softened butter and half the filling mixture, leaving a 1-inch border all around. Starting with edge nearest you, roll rather tightly and pinch the edge closed. The roll should end up being at least 18 inches long; if it is shorter, just press and roll until it is 18 inches. Coil in buttered or sprayed 8-inch round baking dish or cake tin. Press lightly. Cover lightly with sprayed plastic wrap and let stand at room temperature for 3 hours, until puffy (not doubled). Repeat with other half of dough. 10 Preheat oven to 350 degrees. Bake at 350 degrees for about 35 minutes. 11 Let the coffee cake(s) cool about 20 minutes; make glaze. Whisk together powdered sugar and hot water until smooth; whisk in maple syrup. Drizzle over cake(s). 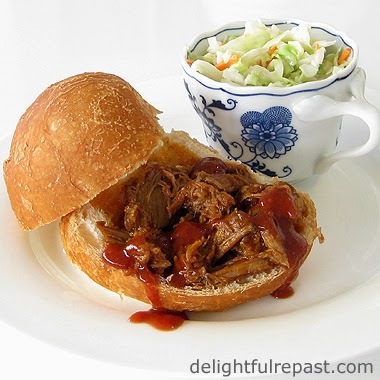 Slow Cooker Pulled Pork is the only way to go when it's hot. My Oven-Barbecued Pulled Pork recipe is wonderful, but it calls for running the oven for three hours or so, not something I want to do on a hot day! Or on a day I don't have time to monitor it. Because of that, I never used it much and eventually donated it. So I never dreamed I'd be using my new slow cooker, Cuisinart MSC-600 Cook Central 3-in-1 Multicooker, this much! 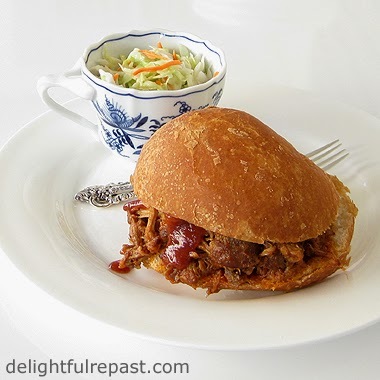 At least twice a week I use it to make soups, stews, desserts and now Slow Cooker Pulled Pork. Note: Cook the pork shoulder one or two days before you need it. Besides saving work on the day you serve it, it allows you to easily remove the fat from the sauce. 1 Heat the cooking pot of the Multicooker set to Brown/Saute at 400 degrees. Trim away the large pieces of visible fat on the pork shoulder and cut it into 4 pieces. Season the pork with 1/2 teaspoon each salt and pepper. Add the oil to the pot and brown the pork on both sides. Note: If your slow cooker does not have this capability, brown the pork well in a large skillet on the stove. 2 Add the onion, carrot and celery to the pot. Sprinkle on remaining salt and pepper, marjoram and thyme. Add the wine. Cover and switch unit to Slow Cook on Low for 8 hours. 3 Transfer pork to large bowl. With two forks, shred pork, removing any large pieces of fat. Remove onion, carrots and celery (I always eat them because I hate to waste food, but I won't judge you if you don't!) and strain braising liquid into 1-quart glass measure. Put pulled pork back into the cooking pot (now turned off). 4 In small bowl, whisk together sauce ingredients. Stir sauce into the pulled pork. Or you can hold out 1/3 cup, if you like, and spoon a little on top of the pork in each sandwich. 5 If serving another day, refrigerate braising liquid until fat solidifies on top; remove the fat. If serving right away, skim liquid from top with a small ladle. You will probably have about 3 cups of defatted braising liquid. In small saucepan, boil liquid down to 2 cups. Stir 1 cup of it into the pulled pork; reserve the rest to add when reheating pulled pork. 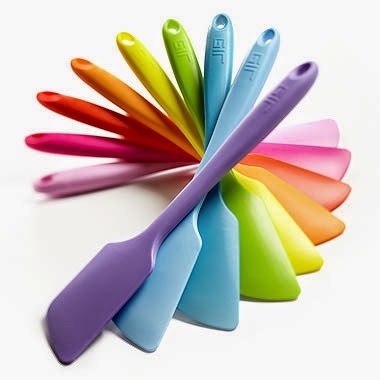 6 Serve immediately on warm rolls or cover tightly and refrigerate until ready to reheat and serve. It's really extra special on my Homemade Buns! Steamed pumpkin pudding makes a sweet addition to the autumn table, especially if you're looking for a change from the usual pumpkin pie. But, really, why not have both? Making it in the slow cooker frees up the oven and stovetop for other things. Steamed puddings are something I've always done in the oven, though they're probably more often made on top of the stove. Since getting a 6-quart oval slow cooker, I've been having fun developing new recipes and adapting some of my old recipes for it. 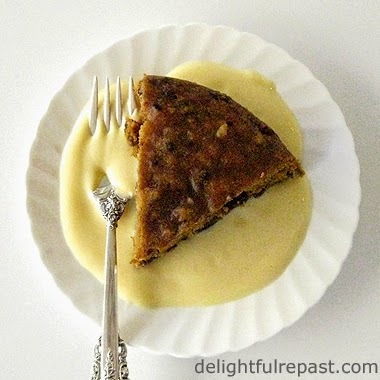 Steamed puddings and their traditional accompaniments, hard sauce and custard sauce, are part of my British heritage; and I like to trot them out during the fall and winter months especially. If I were using a deep basin or mould as my mother did, I'd have to steam the pudding in a deep pot on the stove. But a 2-inch deep 7-inch cake tin fits nicely in my slow cooker. What desserts are you trotting out for autumn and winter? 1 In small bowl, soak raisins in brandy, rum or hot tea for 30 minutes to plump them. 2 Butter well and lightly flour a 2-inch deep 7-inch round cake tin. In small bowl, whisk together flour, soda, salt, cinnamon, ginger, nutmeg and cloves. 3 In medium bowl, cream butter and sugar. Beat in egg, then pumpkin puree, followed by the vanilla and milk. Stir in the flour mixture followed by the nuts and raisins. Turn into buttered tin and cover tightly with foil. 4 Place rack in bottom of cooker, and add water to just below the rack (that's about 2 1/2 cups in the Cuisinart MSC-600 Multicooker). Set the pudding on the rack. Put the lid on the slow cooker. Set to Slow Cook on High for 2 1/2 hours; do not lift lid. 5 Remove the pudding to wire rack, remove foil and let pudding stand 15 minutes before unmolding onto a small platter. Slice and serve warm with whipped cream, hard sauce or, my favorite, Custard Sauce. 6 While pudding is steaming, make Custard Sauce. If you prefer your Custard Sauce cold, make it several hours or up to 2 or 3 days ahead. Afternoon tea, as my regular readers know, is a way of life for me. Whether hosting afternoon tea parties in my home or garden or going out for afternoon tea, it does something for me that no other dining experience can. Spending time with a friend in the Los Angeles area (a friend I introduced to tea more than twenty years ago) happened to coincide with an invitation to try the afternoon tea at the legendary Hotel Bel-Air. My first visit to the Bel-Air was for a friend's wedding 24 years ago. Now, as then, I was surprised and delighted by the illusion of being miles from the city. Hotel Bel-Air is not so much a hotel landscaped with gardens as it is lush gardens that include a hotel. Part of the Dorchester Collection, it is a luxury hotel but somehow manages to evoke laid-back-California-casual in a way you wouldn't expect from a big-city hotel. On this comfortably warm early autumn day, tea was served on the open-air, but sheltered, "alfresco" terrace. 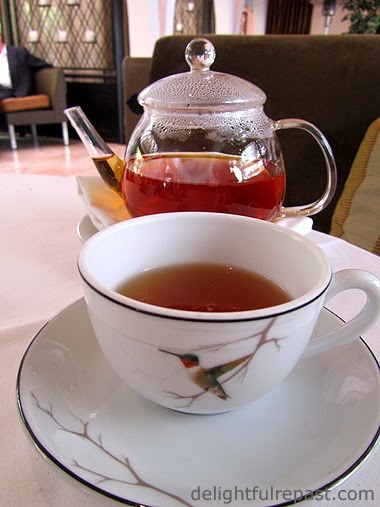 We enjoyed a glass of mineral water (still or sparkling) while our chosen loose leaf black teas, Darjeeling and Assam, were brewed and decanted, eliminating that problem of the last cups from the pot being "stewed." 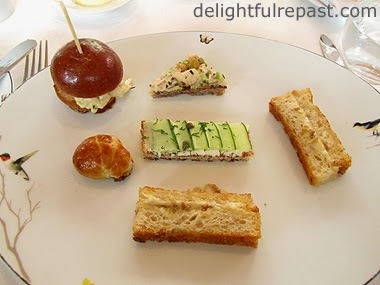 First up was a delightful assortment of sandwiches: a crab roll on a brioche bun, cucumber and herbed cream cheese on toasted pain de mie, organic chicken salad on walnut bread, wild mushroom duxelle and goat cheese en croute and two fabulous Gruyere and caramelized onion "grilled cheese" on sourdough. I'm sure the house cured smoked salmon with dill cream and micro arugula on brioche sandwich is superb, but neither of us really like smoked salmon and so, on our server's recommendation, replaced it with the grilled cheese. In a word, fabulous! 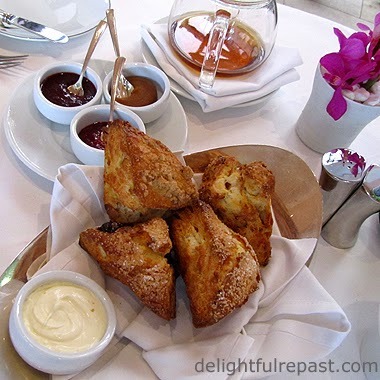 Then the warm sour cherry, blueberry and buttermilk almond scones were served with quite an assortment of accompaniments: housemade raspberry jam, strawberry jam and apple butter; Echire butter and Devonshire cream. If you're a stickler for traditional scones, brace yourself; these "scones" are more like a puff pastry, perhaps not a "true" scone but delicious nevertheless. More pots of tea got us through the final dessert course: chocolate dipped cream puff, coconut macaroon, French macaron, pistachio financier and huckleberry cheesecake. 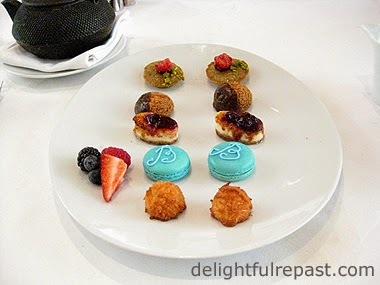 I'm not really one for sweets but must say I especially enjoyed the pistachio financier and gorgeous little cheesecake. I always save a sandwich, in this case my "extra" grilled cheese, to have at the end; I like to think it balances out the sugar. Good news for those with special dietary requirements: you can order their recently launched "healthy" afternoon tea with gluten-free and sugar-free options. 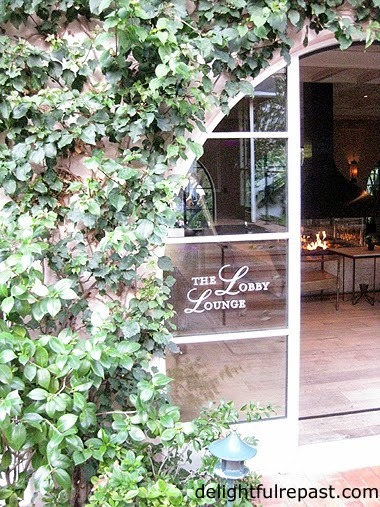 For reservations, call Wolfgang Puck at Hotel Bel-Air at 310-909-1644. For tea at home, see: How to Make a Proper Cup of Tea and Tea and Scones. Look under Teatime on my Recipes index page for other teatime recipes. Disclosure: Though I attended the afternoon tea as a guest of Hotel Bel-Air, I assure you that does not alter my opinions or affect my review.